Website visitor Massimo D. wrote to wrote to ask that I scan and post this article for the "Sunday Flyer," an .020-powered, stick-framed glider with a "V" tail. What made this model unique was that it was a single-channel job with an escapement that drove both halves of the "V" tail. Mr. D. did not say what type of radio he plans to use in his Sunday Flyer, but I assume it will probably be two proportional channels with nano type servos. I wouldn't be surprised, either, if it ended up being powered by a brushless motor. The author hand-launches his light-weight powered soarer. Built-up construction will please those who like the good feel of open framework, and the sun shining through the covering. Sitting pretty as you please on the designer's workbench, the little ship is set to go. The high thrust line makes for a good, fast, clean trim. There are long-haired reasons for that V-tail, but perhaps the best of all reasons is that it's nice to have a change of pace in styles. Linkage is different, but no bother at all to form. Easy power-boosted flights up into those thermals and long, soaring glides add up to enjoyable, relaxed flying sessions. It takes just an 02 for power. 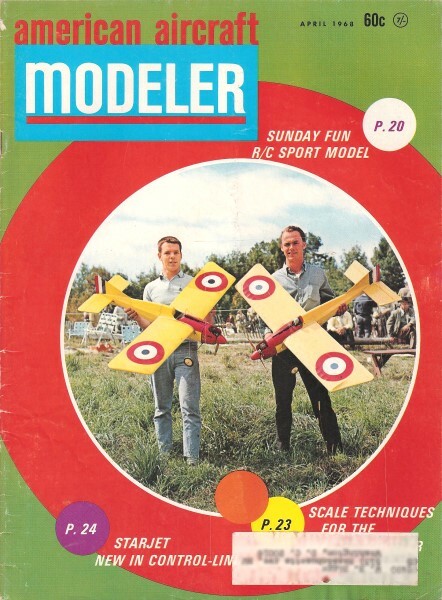 A light, buoyant soaring model capable of relaxing flight, is my idea of Sunday fun. This powered glider was designed to be just that. It is an uncomplicated and conveniently sized ship not critical in any particular dimension. It uses a relatively high-lift wing that will act predictably. The flying speed isn't great but the model can penetrate well. This is because the wing section is fairly thick and lifts a load easily, but is trimmed to fly flat and fast. It is basically a Clark-Y section, no undercamber or reflex. To facilitate this flying characteristic, the model purposefully is made as light as possible. It will catch the good thermals and stay up for long enjoyable flights without difficulty. It also will ride the slope lift easily. The butterfly tail configuration was chosen for only a few good reasons. First, using only two surfaces at the tail, there is less building to be done! Second, they cause less total aerodynamic drag. And third, the use of two control surfaces gives very positive control of the plane, yet a flat turn. Turns without the usual steep banking in a thermal, or at the edge of the slope lift, should be as flat as possible, yet in a very tight radius. A butterfly tail controls bank while causing powerful turn. I suppose yet another slight benefit is that the dirty exhaust of the engine flows clear of the flying or control surfaces, hence a cleaner model. When sitting on the ground or while landing, butterfly tails do not catch the ground first and break. 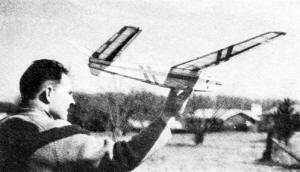 Model will slide to a stop and rest on a wing gently. After many flights you'll appreciate this bonus - less patching or spar splicing. And they look better! The construction is neither difficult nor easy. It is supposed to be strong, and I assure you it is! Since the lighter they are, the softer they fall, I have designed as light and durable a model as possible. Wherever stress is expected, an extra brace or spar is found. 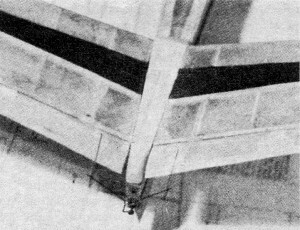 For example, the wing has one short spar. Gliders can build up extra speed trying to dive out of a lift and strong wings help make for smooth landings. Fuselage structure is interesting in the use of corner cap-strips instead of longerons, These strips of light balsa offer all the strength of a longeron as such, but at only a fraction of the weight. Also, you will notice the built-up bulkheads. No great strength is needed of them. 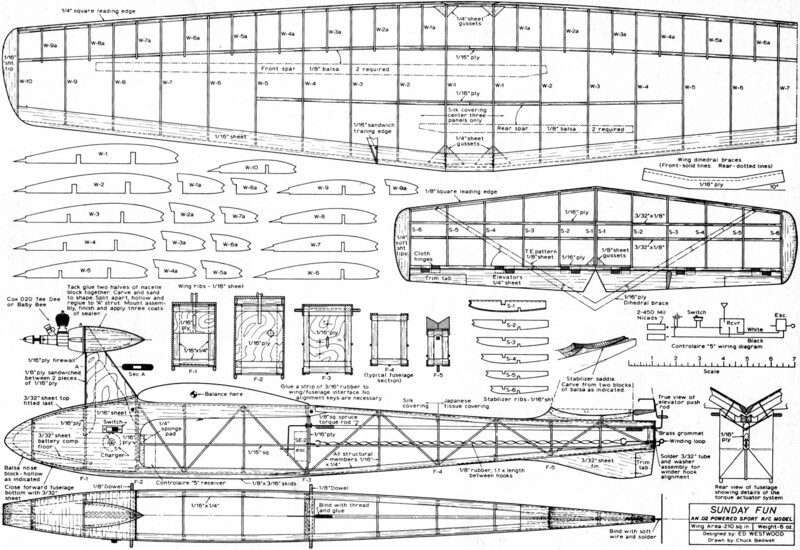 The diagonal braces are quite important parts of the fuselage. They prevent torsional warping and transfer the shock loads of hard landings to the entire structure, hence preserving the plane through rough treatment. The engine is pylon mounted. It is as streamlined as practical, and its particular shape helps to cancel torque effect of the motor. There is no rudder as such at the tail for the swirling propeller slipstream to blow against. One word of advice, keep the RC installation as light as possible. Use strong batteries - your flights might be longer than you planned! Wind up that escapement well before each flight. Or use a light motorized unit - but then use light NiCad batteries. Escapements are preferred in this model because they are light in weight. Light weight makes a small plane possible. Happy soaring!